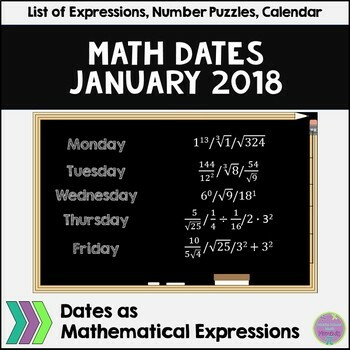 Using dates as mathematical expressions is a great way to expose students to new math rules (like cubing or cube roots or exponent rules, etc) or review rules (or facts) that students have learned (like squaring or order of operations!). 3) A calendar for students to record the date’s expression and their work for reaching a solution. The calendar also includes the direction for students to create their own expressions (I've found that some students really like this challenge). 4) A cross number puzzle (with key) that includes about half of the dates for the month (they’re the same expressions as those in the monthly list.) This can be used for early finishers, a challenge day, or a sub day (any time during the year). 5) A Find a Number puzzle using the other half of the dates for the month. This one will take students longer to complete than the Cross Number puzzle. Click for more Math Dates months (or the full year)!